The effect of over-expression of cytosolic Cu,Zn-superoxide dismutase (cytsod) and ascorbate peroxidase (cytapx) alone, or in combination, in tobacco plants, increased the resistance to bacterial wild fire, caused by Pseudomonas syringae pv. Tabaci. In the non-transformed controls, the inoculated areas with P. syringae pv tabaci became initially chlorotic at 2 days post-inoculation (dpi), then subsequently water soaked and necrotic. At 6 dpi, the necrotic areas extended to the border of the leaves and finally the necrotic area appeared surrounded by a chlorotic yellow area. In transgenic lines harboring cytsod (line 17) or cytapx (line 51) necrotic areas were confined within the infiltrated sites, mimicking symptoms of hypersensitive reaction (HR) observed during an incompatible plant-pathogen interaction. 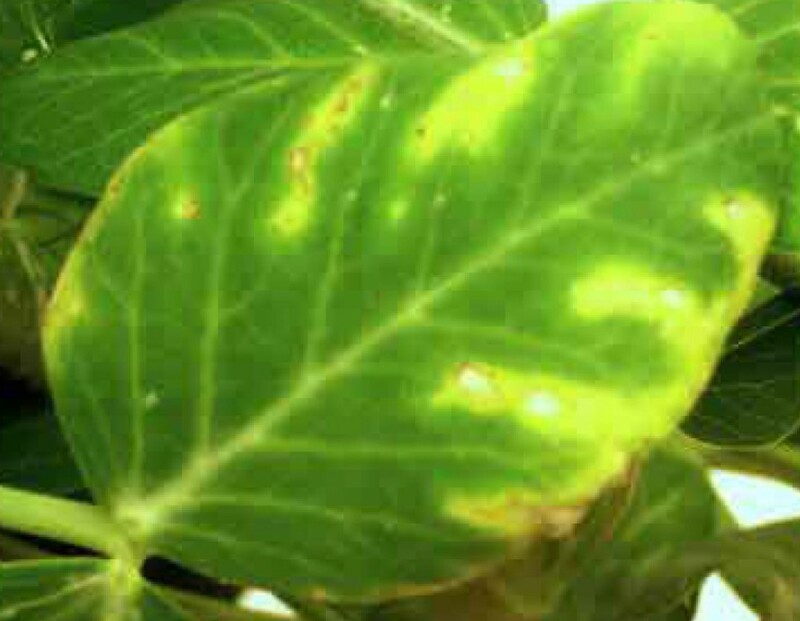 In contrast, in the transgenic lines harboring both cytsod and cytapx genes (lines 35 and 39), infected leaf tissue presented only a chlorotic area and localized necrosis occurred only occasionally (Fig. 1). In addition, the symptoms observations correlated with reduced bacterial growth, mainly in lines showing fewer symptoms (Lines 35 and 39). The reduced necrotic lesions observed in the transgenic lines are parallel with increased antioxidant enzyme levels (SOD, APX, Catalase, and Glutathione Reductase). In this sense, the balance between SOD (O2.--scavenger and H2O2-producer enzyme) and H2O2-scavenger enzymes (APX, Catalase and Peroxidases) is crucial to control ROS accumulation and the triggering of cell death (Fig. 2). The observed resistance of transgenic lines to bacterial wild fire seemed to be independent of tissue necrosis, as observed in other plant-pathogens interactions (Kiraly et al. 1999; 2008). These authors suggested that the induction of antioxidant enzymes might reduce plant cell necrosis after infection (Kiraly et al., 2002; 2008). Fig. 2.- Schema showing the pathogen-induced ROS generation in the apoplastic space from tobacco leaves. Bacterial pathogens stimulated the superoxide (O2.-) generation in the apoplastic space by activating the plasma membrane NADPH oxidase (Lamb & Dixon 1997). Superoxide is subsequently dismutated to H2O2 by the apoplastic SOD. There are potential sources of apoplastic H2O2 generation including peroxidases, amine oxidases and oxalate oxidases (Bollwell & Wojtaszek 1997). Hydrogen peroxide can participate in the lignification process (Ros Barceló 1998) as well as in the direct killing of the pathogens. ROS, such as the protonated form of HO2.- (perhydroxyl radical) or H2O2, can permeate biological membranes. Therefore, an important part of the apoplastic ROS can also originate an oxidative stress in the cytosol, in addition to that produced by ROS originated from chloroplasts, mitochondria and peroxisomes (Diaz-Vivancos et al., 2008; Amirsadeghi et al., 2007; Van Breusegem & Dat, 2006) and can contribute to the induction of an oxidative stress in the cytosolic compartment. This ROS accumulation can induce the HR, manifested as cell death and tissue necrotization. Transgenic lines overexpressing both cytsod and cytapx (lines 35 and 39), can cope with ROS accumulation and avoid tissue necrotization. The results of this work showed that the overexpression of CuZn-SOD and APX in the cytosol of tobacco plants enhances resistance against P. syringae pv tabaci, highlighting the importance of the cytosolic antioxidant machinery in the response to biotic stress, similar to the results showing the importance of this cell compartment in the response to abiotic stress, such as salinity or drought stress (Hernández et al., 2000; Faize et al., 2011). Faize, M., Burgos, L., Faize, L., Petri, C., Barba-Espin, G., Diaz-Vivancos, P., Clemente-Moreno, M.J., Alburquerque, N. and Hernández, J.A. (2012) Modulation of tobacco bacterial disease resistance using cytosolic ascorbate peroxidase and Cu, Zn-superoxide dismutase. Plant Pathol., 61, 858-866. Amirsadeghi S, Robson CA, Vanlerberghe GC, 2007. The role of mitochondrion in plant response to biotic stress. Physiologia Plantarum 129, 253-266. Díaz-Vivancos P, Clemente-Moreno MJ, Rubio M, Olmos E, García JA, Martínez-Gómez P, Hernández JA, 2008. Alteration in the chloroplastic metabolism leads to ROS accumulation in pea plants in response to Plum pox virus. Journal of Experimental Botany 59, 2147-2160. Faize, M., Burgos, L., Faize, L., Piqueras, A., Nicolas, E., Barba-Espin, G., Clemente-Moreno, M.J., Alcobendas, R., Artlip, T. and Hernández, J.A. (2011) Involvement of cytosolic ascorbate peroxidase and Cu/Zn-superoxide dismutase for improved tolerance against drought. J. Exp. Bot., 62, 2599-2613. Hernández, J.A., Jiménez, A., Mullineaux, P.M. and Sevilla, F. (2000) Tolerance of pea (Pisum sativum L.) to long-term salt stress is associated with induction of antioxidant defences. Plant Cell Environ., 23, 853-862. Király L, Cole AB, Bourque JE, Schoelz JE, 1999. Systemic cell death is elicited by the interaction of a single gene in Nicotiana and gene VI from cauliflower mosaic virus. Molecular Plant-Microbe Interaction 12, 919-925. Király Z, Barna B, Kecskés A, Fodor J, 2002. Down-regulation of antioxidative capacity in a transgenic tobacco which fails to develop acquired resistance to necrotization caused by TMV. Free Radical Research 36, 981-991. Király L, Hafez YM, Fodor J, Király Z, 2008. 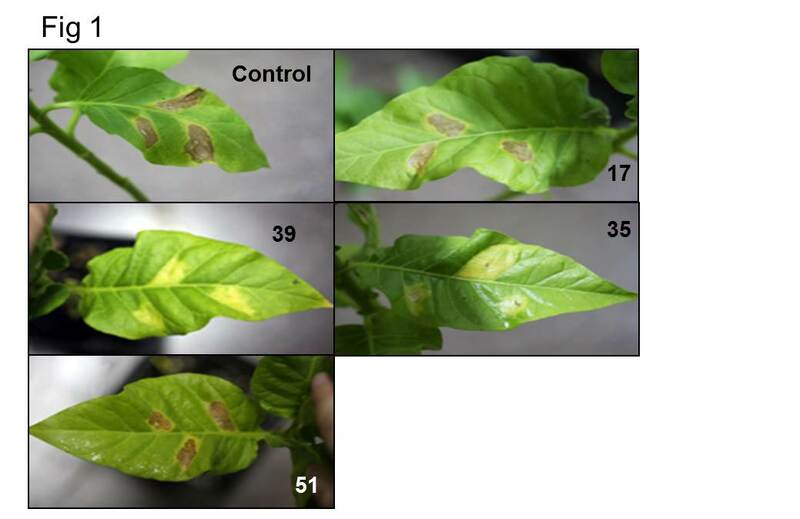 Suppression of tobacco mosaic virus-induced hypersensitive-type necrotization in tobacco at high temperature is associated with downregulation of NADPH oxidase and superoxide and stimulation of dehydroascorbate reductase. Journal of General Virology 89, 799-808. Lamb C, Dixon RA, 1997. The oxidative burst in plant disease resistance. Annual Review of Plant Physiology and Plant Molecular Biology 48, 251-275. Ros Barceló A, 1998. The generation of H2O2 in the xylem of Zinnia elegans is mediated by an NADPH-oxidase-like enzyme. Planta 207, 207-216. Van Breusegem F, Dat JF, 2006. 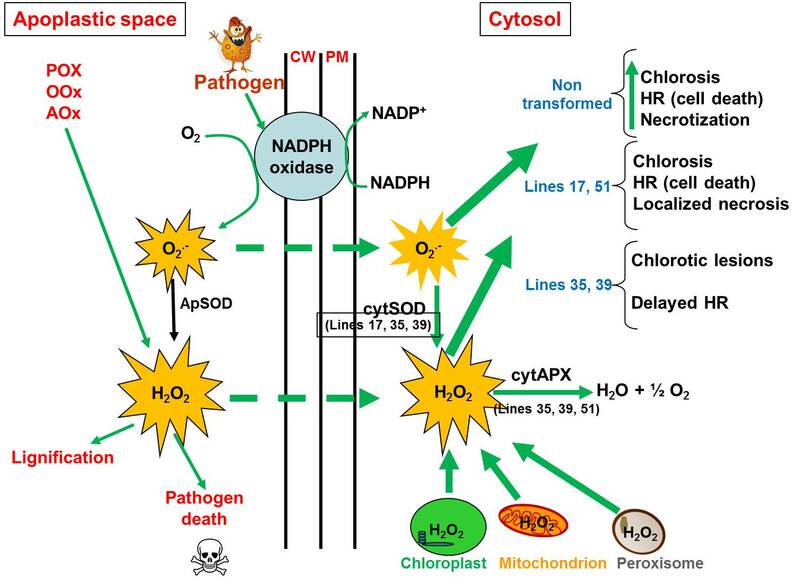 Reactive oxygen species in plant cell death. Plant Physiology 141, 384-390. Categorías: Biotic stress, Oxidative stress | Enlace permanente.